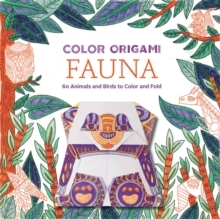 Color Origami: Fauna features instructions and patterned sheets to colour and fold into a menagerie of animals. 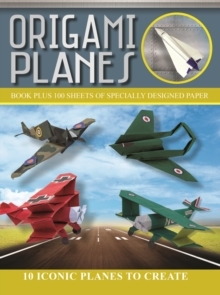 Pad-bound with removable pages, it contains more than 60 intricately hand-drawn origami papers that are also lightly printed with folding guidelines. 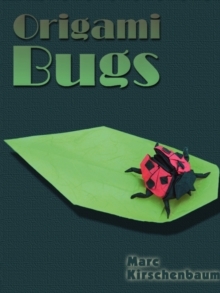 The book boasts a range of projects, including elephants, pandas, lions, peacocks, horses, foxes, frogs, and rabbits. 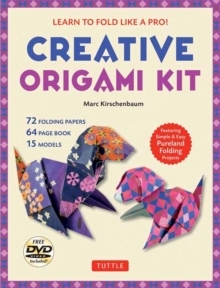 Many of the origami designs come in two sizes (two large and four small), so you can fold animal families with two parents and four babies.